Last week, a PlayStation employee took matters into his own hands when a New Jersey-based gamer with Cerebral Palsy contacted the company explaining his problem with DualShock 4. The employee took his time to customize a controller (pictured above) for the gamer in such a way that it would accommodate his condition, and surprised him with it. Here’s how it went. A couple of weeks ago, Peter Byrne contacted PlayStation Support to explain his issue with the DualShock 4 in light of his condition along with an image of what his left hand looked like when he gripped the controller. He was given an email address through which an employee named Ajmal Alex Nawabi got in touch with him. After exchanging a series of emails discussing the issue, Nawabi told Byrne that he was unable to do anything for him but will be sending him a PlayStation goodie bag. Turns out, the goodie bag contained a custom controller specially designed by Nawabi for Byrne, with a letter explaining that he didn’t want to ruin the surprise. Here’s Byrne’s Facebook post explaining the situation in full, followed by an image of Nawabi’s personal letter to him. I figure I share this story with everyone because it is too good not to share! When I use the PlayStation 4 controller my game constantly pauses because my left hand hits the touchpad which is frustrating for me. Around two weeks ago, I decided to message PlayStation support and they gave this email address and said tell them my issue and wait for a response. A man by the name of Alex Nawabi from PlayStation messaged me and told me he was taking my matter personally and not on behalf of PlayStation. I explained to him my problem with a controller as well as my condition of cerebral palsy. I even had to give him a visual of what my left hand looked like gripping the controller. After a series of back and forth emails. Mr. Nawabi told me he was ordering some parts to come up with a solution for me. He emailed he last week saying that he tried to come up with a solution but it didn’t work. However, he would send me a PlayStation goodie box anyway. 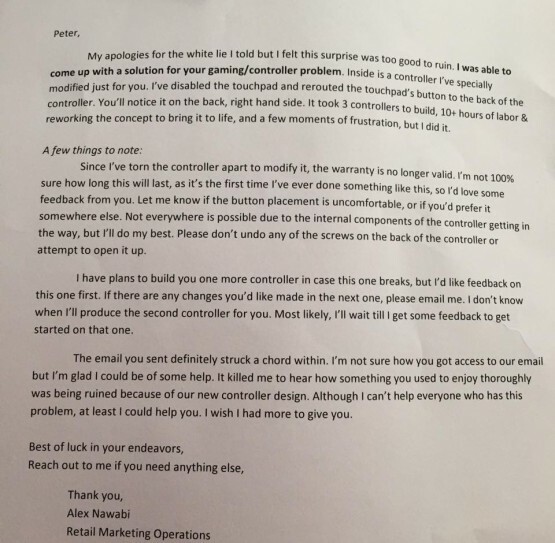 I received that box today and inside was the modified controller especially made for me and this letter. I honestly got choked up reading the letter as I did not expect anything like this to happen. Mr. Nawabi really cared about my situation and did this on his own time to make my experience better. I honestly can’t thank him enough for everything he did for me. Thank you Mr. Nawabi it really means a lot too me! Thank you all for the kind words. I’m eternally grateful. Seeing how happy he is, and how stoked his mom got, has me in tears. Please keep in mind that the Research and Development team at PlayStation is filled with some absolutely astounding individuals who wake up every day and try to come up with a solution for everyone. What I did only works for a single individual and it should not undermine their work in any way. I cannot stress this enough. Without them, we wouldn’t even be close to what we are today. If you’re not aware, they’ve recently added more accessibility settings that let you remap buttons to help with a large portion of needs. Their team members are the true MVPs. I’ve always cared, I always will care. Well done, Mr. Nawabi and happy gaming, Mr. Byrne!